I won’t deny it, I am a wee bit of a rubbernecker. Yes, I know I shouldn’t do this, but, you know, I shouldn’t watch the Bachelor either…and you know how well *that* one works out for me. When I see giant backups on the highway, I am ever-so-thankful that the accident wasn’t mine. I did that once twice, thankyouverymuch, and it was not a situation I care to be in again. Also, I have weird fears about being in accidents. You know, I don’t worry about my health and safety, like a normal person. Oh no. I worry about whether or not the person pulling me from my vehicle would judge me for not wearing underpants. No really. Wait, it gets better. I also worry about the impact forcing the seatbelt to empty my bladder or possibly make it explode. SIGH. Folks, I am afraid of peeing myself in front of paramedics. Don’t even get me started on my fear of tampons while driving. You don’t even want to know. Or, you know, something totally normal.Â Like a milkshake explosion. Whatever. You think nothing of hitting the Chick-Fil-A (dwarf house, ftw!) drive-thru for a healthy lunch of waffle fries and a cookies-and-cream milkshake. And then you get distracted and drive the wrong way on a one-way street. And then you get on I-85 with some precious cargo in tow and the lid pops off of your overstuffed shake and suddenly there is delicious goodness everywhere. On the steering wheel, the cup holders, the lap, the door. And while you try to wipe yourself down with a combination of baby wipes and your own tongue, your cargo is pretty sure they are safer walking back to Sandy Springs than staying in the car with you and your 790 calories of dangerous tastiness. And while I was reassuring her in my very best Rainman…thatÂ I’m an excellent driver, all I could think about was how thankful I was that I had chosen to put on underpants and that I had peed before we left Anissa’s. « It *May* Even Have Training Wheels. Lately I have an unhealthy fear of volcanos. So, you know, we’re all crazy in our own way. Ok wait. There were 790 calories in that thing!?!?!?! It’s like you read my mind. That peeing thing frightens me to no end. 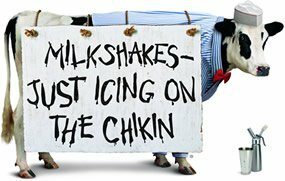 So, uh, if it makes you feel any better, the Chik-fil-A cookies and cream milkshake only has 700 calories. And oddly, I DO want to know about the tampons|driving thing. Is that weird? Totally weird. I’ve never had those fears about an accident. But I will now. I do have fears about what my family will find in my house after I die. Like, will they read my journals? I knew someone in high school who CHANGED HER TAMPON WHILE DRIVING.